Google has brought to VR the closest thing we have to Jurassic Park yet. 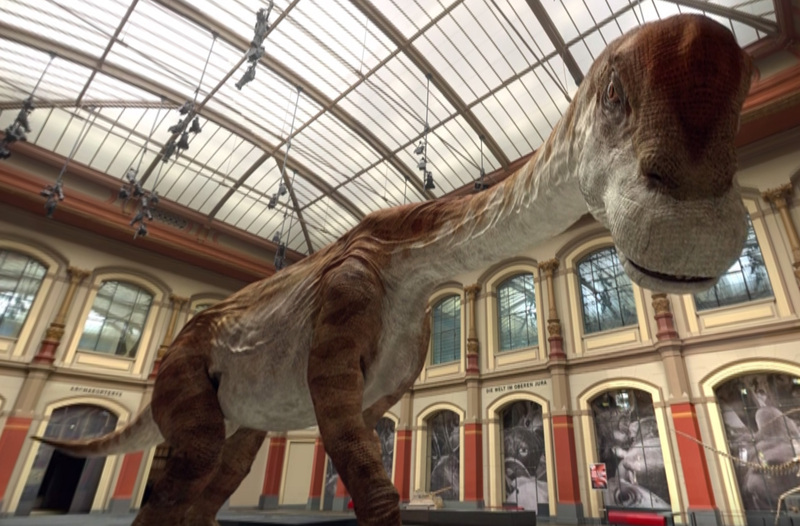 The newest feature of Google’s Arts & Culture app has added a giant swimming rhomaleosaurus to a 360º virtual tour of the Natural History Museum of London. And it doesn’t stop with this 23-foot long aquatic predator. Google is already working with 50 natural history museums to bring 150 more enormous dinosaurs to life. So you can expect to see a lot more dinos before the year is up. If terrifying carnivorous dinosaurs aren’t your thing, you can watch the grown-up version of Little Foot from Land Before Time — the gigantic herbivore giraffatitan — stomp around Berlin’s Museum für Naturkunde and knock down a tapestry. Google says the animations were “painstakingly created” and checked by scientists to ensure biological accuracy. The virtual museum tours and ultra affordable $20 price tag of Cardboard also offer great K-12 educational opportunities. Google Expeditions uses Cardboard to take thousands of children across the world on virtual field trips. There’s some other dino Cardboard content out there, too: Raptor Valley drops you in a basin of ferocious velociraptors and challenges you to survive the night. Take a look at the 360º YouTube video of the aquatic rhomaleosaurus below to see Google’s new dinosaur. Don’t worry, he can’t bite you (yet). And you can also check out the more peaceful (but still terrifyingly huge) giraffatitan below.